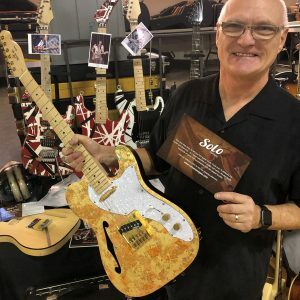 Congratulations goes out to Kevin Niehaus for his guitar build, to earn him Guitar of the Month for November 2018. 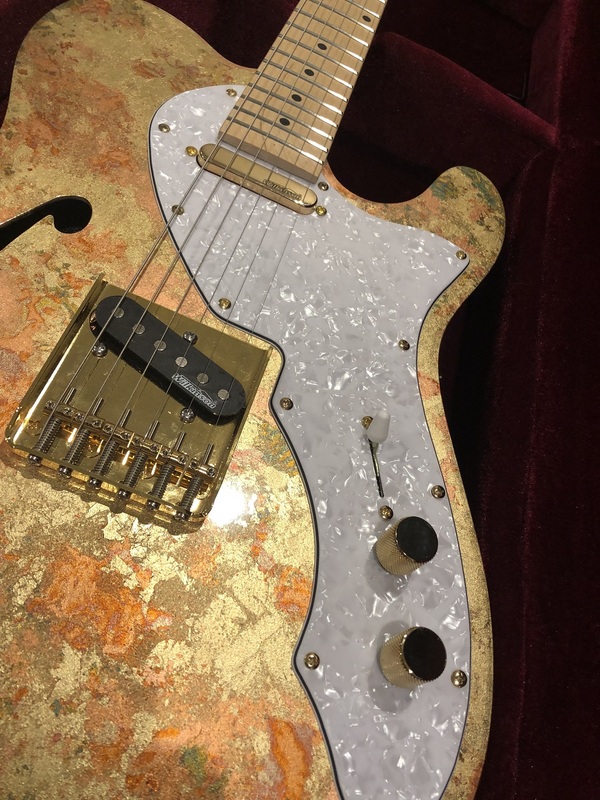 Kevin used our TCK-100 guitar kit, to create his guitar. 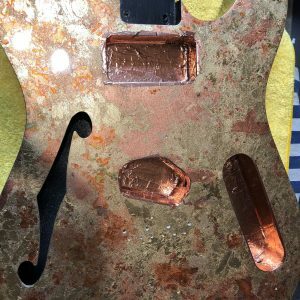 “The concept for this project, came from a video I saw where gold flake was used in an application on a motorcycle tank – that led me to thinking about using it on a custom guitar. 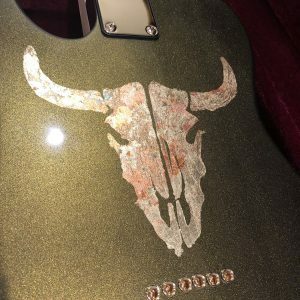 My original plan was to completely cover the whole guitar with gold leaf, however, once I completed the front, my vision changed and I thought having a contrast colour on the back with a western style graphic highlighted with the same gold leaf used on the front. I started with the Solo TCK-100 semi-hollowed body and sanded the wood down using about a 600 grit sandpaper. I then applied a sealer coat of primer before painting the entire guitar gold. Next, I applied two coats of colour which was a mixture of green, black and gold with gold flake added to give it more sparkle. The next step was to add the gold leaf. 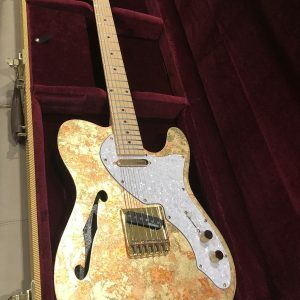 I carefully applied the gold leaf to the front of the guitar and I used the same gold leaf in the graphic on the back of the guitar. The product was very finicky to work with however that wasn’t a problem as there’s nothing precise about that type of finish. I laid down three coats of automotive grade clear coat and left to dry for 2-3 days. I started the sanding process with a 1000 grit paper and worked my way up to 4000 grit before finishing off with a high-grade polish to bring out the shine. 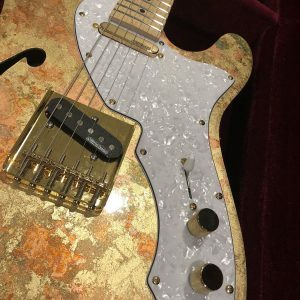 As for the hardware, I chose to highlight the gold leaf finish with gold hardware so I used a Solo Pro TC Vintage-style bridge, Wilkinson MWTN Tele Neck pickup, and finished off with a Wilkinson MWTB tele bridge pickup. I used 2 Fender 250K pots for volume and tone and finished off the electronics with a Fender 3-way switch. Since the project took a western theme for me, I selected a Fender pearl pick guard which I felt set off the whole guitar beautifully. Everything I used on this guitar was available for purchase through Solo Guitars. The guitar turned out amazing and not only is it beautiful to look at, but it plays and sounds beautiful as well. The best part of this guitar is the sound. It is gold!